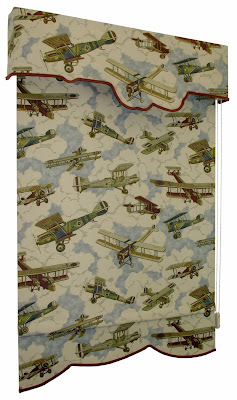 for Customer’s Fabric Shades or Romanzia In-House Fabric Shades. The ideal solution for child safety concerns. To lower the shade, pull the hembar down to the place you want it to stop and let go. To raise the shade, pull the hembar down about an inch and release - the shade will glide slowly up to its preset upper limit. Available with or without Cassette Systems or Shade Topper Valances. 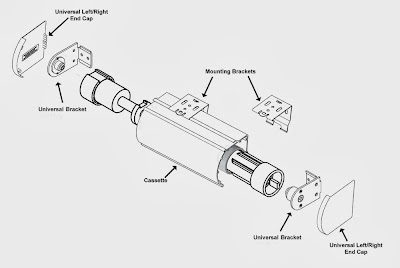 Shades are pre-mounted on a headrail or in a cassette system. 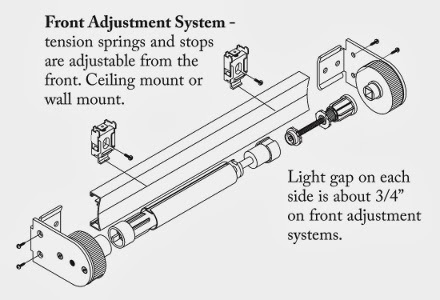 Headrail or cassetes are them mounted using snap-on brackets. Tension and Stops are pre-set at the factory but can be easily adjusted on site. Available with either side or front tension and stop adjustments. 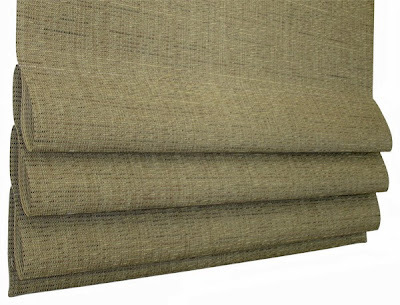 Choice of Regular or Reverse Roll shades. These terms describe how a shade’s cloth rolls off the top of the roller. The cloth rolls off the back of a regular roll shade. The cloth rolls off the front of a reverse roll shade. Regular roll will be furnished unless reverse roll is specified. Turned bottom hem with enclosed weight. 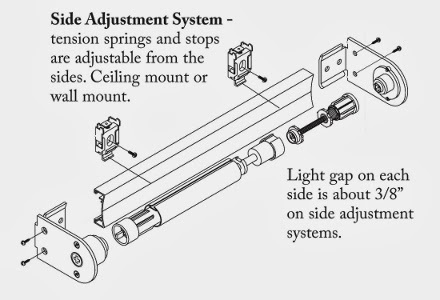 Minimum Width - The minimum width for a cordless roller shade is 29-1/2” bracket to bracket. 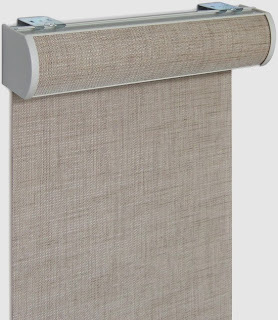 Maximum Width - The maximum width for in-house fabric cordless roller shades is 96”; customer’s fabric shades are limited to the width of the customer’s fabric - up to 60”. Shades are pre-mounted in the cassettes. The cassettes are then mounted with simple spring clip brackets. 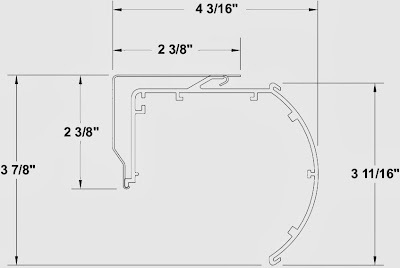 Large Cassettes are 3-7/8” high x 4-1/4” deep. 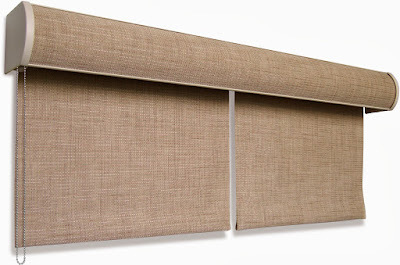 Multiple Shades can be pre-mounted in a single cassette system with a 1” gap between panels. All have a standard matching fabric insert. Standard cassette colors are White, Vanilla, Bronze, Black, and Silver-Gray. Custom colors are available at extra cost. See roller shade options price list. French Gimp supplied by Romanzia - Romanzia maintains a stock of over 150 colors of French Gimp. 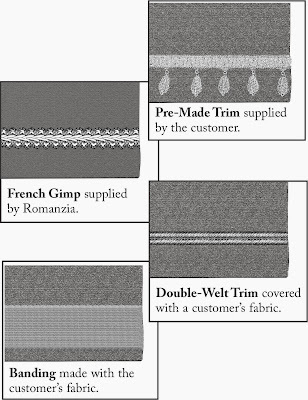 Double-Welt Trim covered with Customer’s Fabric - A yard of fabric is needed to make double-welt trim. One yard is enough to make trim for several shades. Banding made with Customer’s Fabric - Available on straight hems only. Extruded aluminum with a White, Vanilla, Bronze, Black, or Silver Gray finish. Add $7 per foot of shade width. Rod Tabs - bottom hem with looped tabs to hold a rod ( rod is supplied by the customer ). Add $16 per tab. Designed to the customer's specifications. 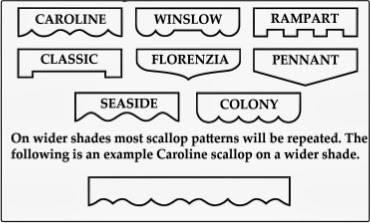 Romanzia® is a Registered Trademark of Window Covering Specialties, Inc.
All Contents Copyright © 2003-2018 Window Covering Specialties, Inc. All rights reserved.